Good as a stand and a standalone cabinet, this one is a must have for your dwelling. 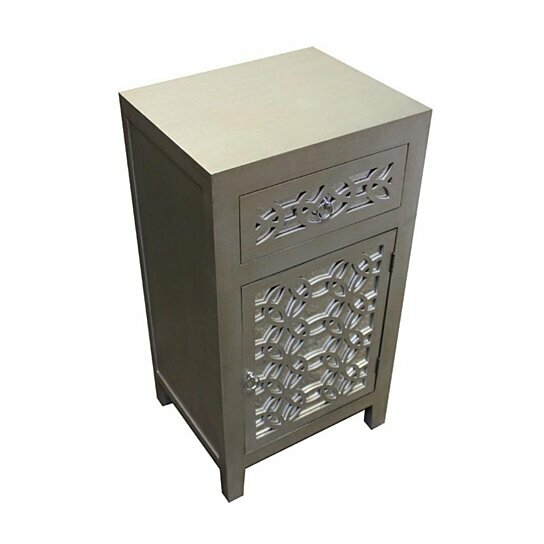 This cabinet is washed in gold gray and has a shiny finish. It is a box like with one drawer and a closed storage beneath it. The door and the drawer feature mesh pattern with ring handle. This makes accessing the cabinet easy. Adorn it with a decorative vase, figurine or a lovely timepiece. The drawer and closed cabinet have ample room space to keep in necessary things. You can keep this cabinet in your bedroom, living room hallway or guest room. At work, you can keep it in the lobby area. Not occupying much room space, can be place in small rooms.